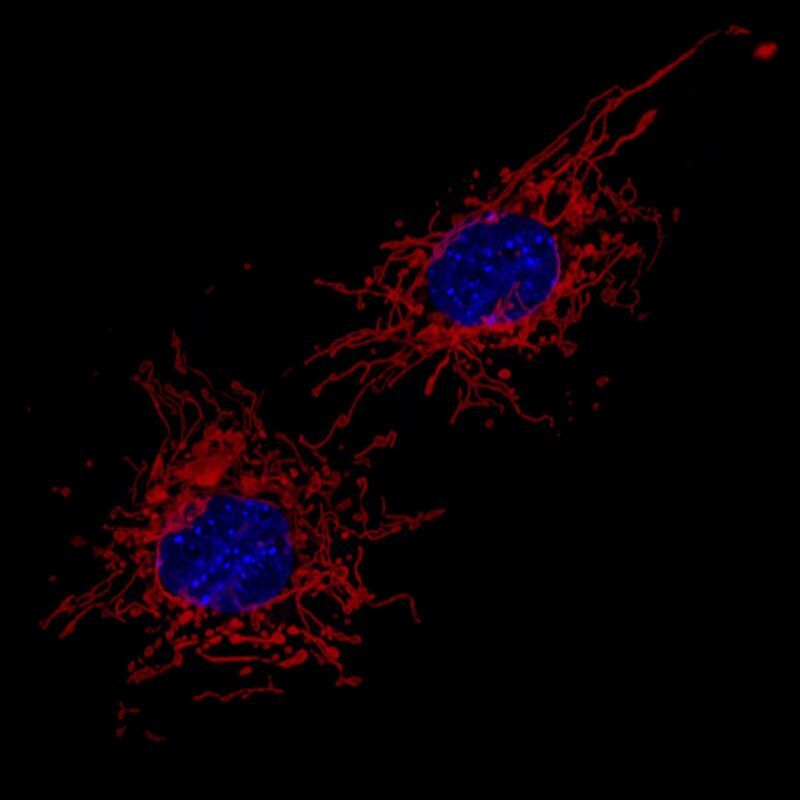 Enlarge/ Mitochondria (red) and cell nucleus (blue) of two connective tissue cells prepared from mouse embryo. The vast majority of our DNA—the chromosomes in the nucleus of each cell—is just what you’d expect: a mix of genetic material from both mother and father. But mitochondria are an exception. They contain a relatively tiny amount of DNA, and in nearly all mammals and even unicellular organisms, that DNA comes strictly from the mother. We’ve even used that fact to trace the spread of humanity around the globe. But in 2002, researchers in Copenhagen reported a jaw-dropping finding. In an effort to work out why one of their patients had extreme fatigue during exercise despite seeming healthy in many respects, they started examining his mitochondria—the energy-generating power stations living in each cell. What they found floored them: the man had mitochondrial DNA (mtDNA) that matched both his father’s and his mother’s. Since 2002, no other cases of paternally inherited mtDNA have been reported in humans, despite several research groups actively looking. But a paper in this week’s PNAS reports mtDNA inherited from both parents in 17 different people from three families. This kind of inheritance is still extremely rare and seems potentially linked to mitochondrial disease, but the robust confirmation of it in humans is huge news for biology and medicine. Taosheng Huang and his colleagues were keen to avoid that kind of problem, so when they found weird patterns in a patient’s mitochondrial DNA, they sent fresh samples to be resequenced. The results came back the same: the four-year-old boy had both paternal and maternal mtDNA, and so did his two sisters. The detective work was just beginning. Huang and his colleagues sequenced the mtDNA of 11 people in the family, finding a pattern of paternal contributions. When they looked at two other families, both with a family member with suspected mitochondrial disease, they found similar results. Altogether, they found 17 people across the three families with mixed mtDNA. In all cases, there was a backup check: the whole procedure was “repeated independently in at least two different laboratories by different laboratory technicians with newly obtained blood samples,” the researchers write. Because the researchers explored the genomes of whole families, they were able to work out the pattern of transmission across generations. Some people in the families weren’t affected; they just had typical maternal mtDNA. It seemed that if a mother had mixed mtDNA, she passed that mixture directly to the kids—the kids would inherit the same mixture she had, essentially getting male mtDNA from further up in the family tree. But if a father had mixed mtDNA, he passed some of his own mtDNA on to his kids. All of this pointed to the males in the family as the likely source of the escape hatch to the normal paternal dead-end. The pattern suggests that there could be a gene running in the families that allows paternal mtDNA to hitch a ride into the egg with their sperm, and then persist there—and that gene is probably in the normal, nuclear genome rather than the mtDNA itself. That genetic trait could then get passed down, giving every male that inherits it the capacity to pass their mtDNA to their offspring. How, precisely, this happens is still completely unknown. Understanding the mechanism that allows paternal transmission in these families would be a huge boost to understanding how mitochondrial transmission works in general—and it could be useful medically, too. “Three-parent babies,” who have mtDNA from a donor to prevent transmission of mitochondrial disease are a recent, controversial, and expensive development—so if there’s a way to get paternal mtDNA to survive, it could provide an alternative possibility for therapy. There’s a lot to explore there, though: it’s possible that evolution veers so strongly away from paternal mtDNA for a very good reason. With human lineages traced through mtDNA, there are potential consequences for our understanding of human evolution, too. That said, genetic estimates of when populations diverged rest on a wide range of data, much of which is still subject to debate and ongoing discoveries. This finding may spark new and exciting work, which will contribute to the pile of research trying to refine those estimates. PNAS, 2018. DOI: 10.1073/pnas.1810946115 (About DOIs).